Light day, twenty miles on a flat surface to get to Norman and Muriel’s. Done in just less than two hours and in the sun most of the time. It looks like to me I should have not much food at all for a while as the most effective way to reduce weight from the bike would actually be to reduce weight from my body. Also I need to get my hair under control, I know I’m going for the santa look but I think I have now overshot it by the length of a small country. Never mind, I’ll take a break tomorrow, finish my book [Sapiens: A Brief History of Humankind] which I highly recommend and then rearrange my bags in an order that makes more sense as I have already found myself needing stuff lodged in the inaccessible back panniers and not the stuff located in the easy access front ones. Finally I’ll start putting some thinking behind the first part of the cross England marathon, 245 miles to the midlands. 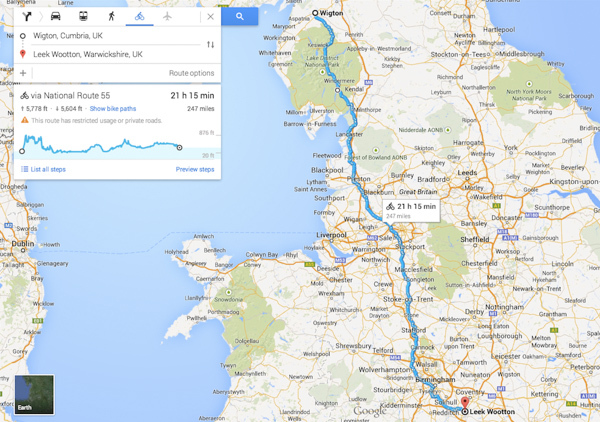 Google quite helpfully has offered cycling advice but the steep rise from Wigton onto the lakes is getting me apprehensive already, I’ll just have to take it one pedal at the time. So provisional I think it changed before I posted it. Insomma te ne vai a Johannesburg in bici per dimagrire….occhio che sei dal lato bagliato della strada! Alex – you are now in god’s country – don’t worry about weight – it’ll soon come off now you’re not on steak every night!! !